If you’re looking for high-performance hemp rope but need to meet a stricter budget, it might be time to consider our jute rope as a suitable alternative. 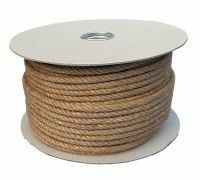 Available in a wide range of diameters our jute rope is available between 4mm and 36mm thickness - lending itself to a huge range of applications in homes, shops and schools around the UK. Increasingly used by designers as banister rope, our jute rope can also be found as decking rope, gymnasium rope, shop window display rope and even Tug of War rope too. 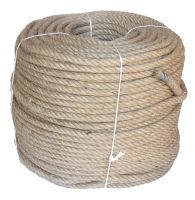 Manufactured for Ropes Direct by our partners in Europe, each strand has a jute outer cover over a robust polypropylene core, giving it the strength you need with a soft handling and aesthetically pleasing exterior. Buy our jute rope by the metre, by coil or by reel - the choice is yours, browse our selection now and then order for fast delivery direct to your door. Commercial customers can also get Next Day Delivery throughout mainland UK when ordered before 12pm.